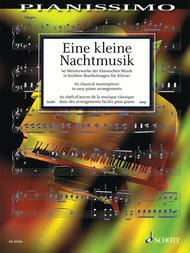 Eine kleine Nachtmusik (60 Classical Masterpieces in Easy Piano Arrangements). Composed by Various. 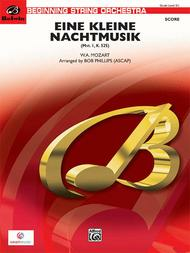 Edited by Hans Gunter Heumann and Hans-G. For Piano. Piano Collection. Softcover. 184 pages. Schott Music #ED20764. Published by Schott Music (HL.49018137).ISBN 3795759889. 9x12 inches.Eine kleine Nachtmusik (A Little Night Music) by Wolfgang Amadeus Mozart is one of the best-known and most poular works of classical music. This serenade was created in Vienna in 1787 and is a pièce de résistance full of sparking humor – a typical ballroom work, composed to entertain guests at an evening party. To this day, this work has lost nothing of its fascination and nothing of its effect on the performers and listeners. The classical concert repertoire contains a wealth of works, including many other wonderful pieces. Many piano players wish to play these works on the piano and get to know them better. This collection contains 60 of these well-known masterpieces of classical music in piano arrangements that are easy to play, yet remain as close to the original as possible. Always liked by the audience, these “all-time favorites” are perfectly suited to make classical masterpieces accessible to students, adults returning to the instrument, and amateurs. This is a treasure trove for piano education and recreational music making. Eine Kleine Nachtmusik (For Flute, Violin, and Piano). Composed by Wolfgang Amadeus Mozart (1756-1791). Chamber ensemble. For Flute, Violin, Piano. Score and part(s). Standard notation. 24 pages. Duration 16 minutes. Published by Theodore Presser Company (PR.114412570).With Standard notation. 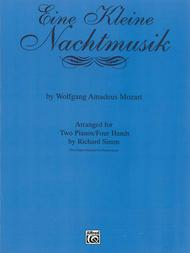 Eine kleine Nachtmusik (Piano (4 Hand)). Composed by Wolfgang Amadeus Mozart (1756-1791). For Piano/Keyboard, 1 Piano, 4 Hands. Schott. 24 pages. Schott Music #ED2505. Published by Schott Music (HL.49003784). 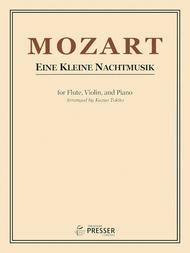 Eine Kleine Nachtmusik composed by Wolfgang Amadeus Mozart (1756-1791). Arranged by Richard Simm. For Piano. This edition: 2 copies required. Duet or Duo; Masterworks; Piano Duo (2 Pianos, 4 Hands). Keyboard Ensemble Series. Classical; Masterwork Arrangement. Advanced. Sheet. 48 pages. Published by Belwin Music (AP.PA9522).ISBN 0769234143. Classical; Masterwork Arrangement.Continuing his successful series of advanced level piano duo arrangements of famous orchestral works, Richard Simm presents the popular Mozart work Eine Kleine Nachtmusik. This duo arrangements offers all four movements, and was taken directly from the orchestral score, so you will find all parts represented here. Each pianist has equal opportunity with melodies, and although a bit of work is required, the two parts fit together easily. Some movements will be great for advancing students. 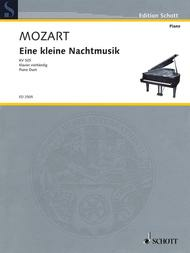 Eine Kleine Nachtmusik composed by Wolfgang Amadeus Mozart (1756-1791). Arranged by Bob Phillips. Orchestra. Masterworks; SmartMusic; String Orchestra. Belwin Beginning String Orchestra. Classical; Masterwork Arrangement. Grade 2.5. Conductor Score & Parts. 62 pages. Published by Belwin Music (AP.26647).Authentic Mozart for young players! Brilliantly arranged, this selection results in a reduced, shortened version of the ever-popular first movement that is very accessible and approachable for young orchestras. Minimal changes have been made, yet all parts remain in first position due to a shift to the key of D. A new addition to the standard repertoire for beginning and intermediate orchestras! This title is available in SmartMusic.Concert/Contest.